On this day in history: Pompeii erupted (allegedly); The Gutenberg bible was completed; Amelia Earhart crossed the Atlantic; Microsoft Windows 95 was released; Ava DuVernay was born. I sent this mix to a friend and he said "I always thought if i had a super power i would want it to be to be able to make my voice sound exactly like a todd edwards tune". I initially wrote a blurb describing the Todd sound but that feels pointless. Here's a mix made up of breakdowns from Todd Edwards tracks. I thought it was a great idea that could get tiresome but it's brilliant. Soothing. It comes from London DJ James Wilson, who's really done a stellar job here. You might have seen me tweet about "sad music that makes me feel sad" earlier this week. This is the album that inspired that thought. It's an album of very soft and gentle humming electronics, hushed vocals à la Grouper, wistful drone and so forth. It's quite sad, generally emanating a feeling of emptiness. Quite a contrast to the Todd mix above. 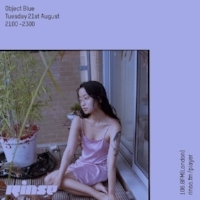 object blue had her debut show on Rinse this week and it's a banger. She played a wonderful selection of tunes, lots of stuff by people she knows through music, breathlessly praising the talented folk she knows. It's refreshing and enjoyable to hear someone dish out these kind words so openly. This is the start of something new project spearheaded by Sunken Foal. He's invited a series of artists based in Ireland to make tracks at a tempo of 101 beats per minute. The artists sound off each other and one gets released anonymously each week. The first is choppy and electronic, moody, with a hint of melody but generally tuneless. I'm excited to see where this goes over the coming months. M A S H A K E L is a SciFi Beat Maker from Palestine. People usually sample the Twin Peaks theme music, either the blissful music also used in 'Falling' or the ominous chords used in 'Go', but here we're treated to an underrated section. It's a painfully wistful selection of sounds used at particularly emotive points, chopped and slopped over rugged beats. It's accompanied by a screwed-up sample of MIKE's Fire Walk With Me poem. As the label says itself, this is a collection of vibes. Bright and bouncy house music. Tchan's 'Yo wtf this dude doing suckin toes in traffic 😂 (without a care in the world mix)' not only has a ridiculous title, it's a crunchy groove with playful melodies and crazy vocal samples. heavymetalmidis' 'SHOCK CULTURE' is a nice and simple beat workout, and EMILY GLASS's 'Winter Blush' is a gorgeous garage throwback jam. Shams Asma makes really excellent music within a variety of styles. It's hard to call her a 'sound artist' as she uses lots of melody and beauty in her work as well as field recordings and weird noises. This one, performed with Christopher Marianetti, features a host of different ideas that gel cohesively, along with a reading of a poem by Giselle Buchanan that feels like a reworking of Woody Guthrie. This release from Peckham's Wbeeza on new label Troy Town is so varied! The title track is a really dark and weird slice of housey techno, with hints of FGTH's 'Relax'. I've listened to it so many times. The second is a much more bright and upbeat number, a soaring keytar-esque synth line full of swooning emotion. The final track is both energetic and wavy, a hazy synth leading things in an unknown direction. Wicked stuff. Here's a gloopy weird techno track. It starts off with some gnarly gurgling bass, then a weird lil melody floats overhead. The line "in my dream" is sampled on repeat, along with some other indecipherable words. It's a trip. A really choppy drum fill adds some menace. Don't really know anything about Melissa except that she's based in Brooklyn. Cool trax.